I’m sure this idea is already out there, but at the time of the economic crash of 2008, I had no idea why we had a housing bubble that suddenly burst and destroyed the American economy. After watching Bill Still’s brilliant documentaries The Money Masters and The Secret of Oz, I now have a much better understanding of monetary policy. So I’m going to succinctly explain the crash of 2008. If you remember, the media told us that the reasons behind the crash were far too complicated to explain, what with credit-default swaps and toxic assets and all sorts of fiduciary jargon that was meant to confuse an issue that, at its heart, is clear and simple. It all has to do with, as Mr. Still puts it, who controls the money supply. When those who control the money supply provide enough money into the system for the system to grow, we have good years. When those who control the money supply contract that supply, we have lean years. The Federal Reserve controls the ebb and flow of the money supply via interest rates. The chart above shows the history of the Fed’s interest rate policy over that past 55+ years. Before we get to the crash of 2008, I want to make a quick point about something that George W. Bush said when he first took office in 2001. I remember this time quite clearly. We had just finished two terms of economic prosperity that the Clinton administration rode through like wave surfers. If you notice the chart above, the Fed began lowering interest rates a little bit in 1990, then the rates plunged starting in 1992, releasing the constraints on the flow of money that facilitated the technology and dot.com boom which was just around the corner. In 1995, the dot.com bubble officially began and the Fed began raising the interest rates. It’s certainly logical to think that the Fed was trying to rein in the free spending of the bubble. But it’s interesting to note in the chart above that interest rates were raised significantly and quickly at the end of 1999 through to 2001 – well beyond the burst of the dot.com bubble in March, 2000. Bush’s outlook on the economy predicted an economic slowdown because he knew that the Fed would continue to raise interest rates — and thereby contracting the money supply. I think it’s also worth noting in the chart above that the recession of 1990 and 1991 to which President Bush alludes follows a spike in interest rates by the Fed — another contraction of money followed by an economic slowdown. So if we look at the chart above around the end of 2001, just after the event of 9/11, the Fed drops the interest rate like a lead balloon. I’m sure that the reasoning was to spur economic activity following the attacks of 9/11 … and perhaps, as well, to make wartime government borrowing more attractive. It also facilitated the buying of houses and property for little to no money down, with low variable payments and attractive initial offers. People bought on credit. Interest rates were low. The economy was vibrant and active. 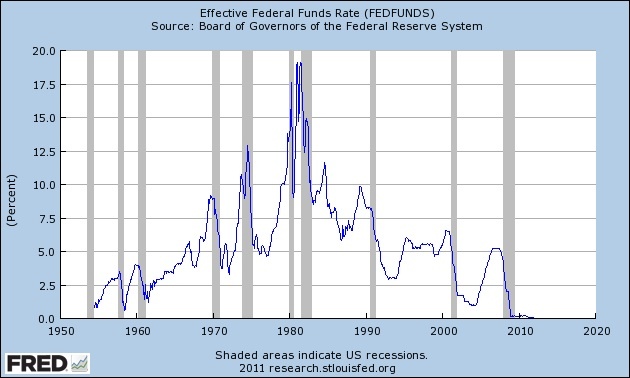 Then, at the end of 2004, the Fed began raising the interest rates sharply. People’s variable rate mortgages shot through the roof — beyond what they were able to afford. Did the Fed help these people by lowering the rates? No, they flatlined the rates sometime in 2006 and held them steady until 2008 when enough people defaulted on their loans to collapse the banking industry. So We, the People, then had to bail out the banks because, as a result of the Fed’s interest rate spike, people were defaulting on their loans. Posted on August 2, 2012, in Finance, New World Order and tagged 2008, bank, banking, banking crash of 2008, banks, bill still, conspiracy, democracy, dot-com bubble, fed, federal reserve, george bush, illuminati, interest rate, money masters, new world order, non-fiction, recession, secret government, secret of oz. Bookmark the permalink. Leave a comment.